I've been using both Windows Phone and iOS for several years now. I'll let you know up front that I use the Windows Phone as my primary phone, but I wanted to share a list of my favorite features from each. I'm leaving out discussions of the hardware involved, and mostly focusing on the core features of the OS. 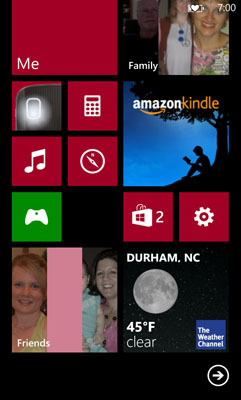 FYI, I'm comparing iOS 6.0.1 on a 4S, and WP8 on a Lumia 920. Let's start from the lock screen. 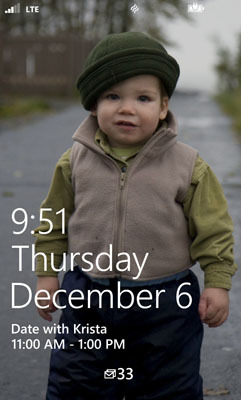 I like how WP makes the lock photo so visible. 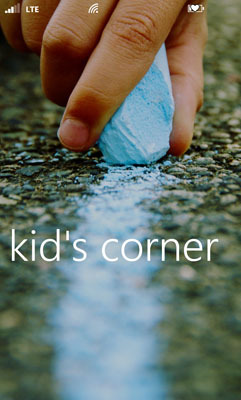 I use mine to showcase a favorite photo of one of my kids, rotating through them periodically. Because WP places extra info just as text, the photo is obscured only a little. iOS includes transparency in the time and unlock bars, but those areas are dark enough that the end result obscures the photo. While we're looking at it, I do much prefer being able to glance at a WP lockscreen to see my next calendar event, today's time (and date! I use that too often:)), and counts of messages and email. 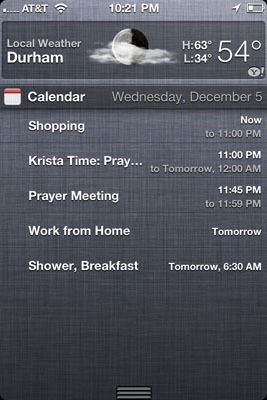 Notifications are an important part of the phone experience, and iOS does them well. I like how I can use, per app, if I want to a popup notification, as a banner (or "toast" notifcation in WP lingo), or not at all. The Notification center is very useful in reviewing my current set of notifications. 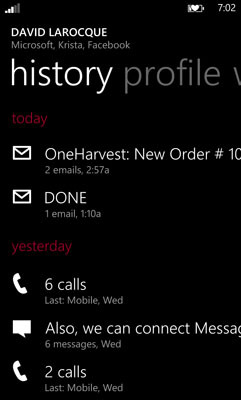 WP's live tiles provide much of the same functionality as the Notification Center, but misses the ability for me to customize how I'd like to be alerted in the first place. Live Tiles do give me choice in which ones I include, though, and effectively allow me to select which things I consider important, like weather or updates from just family members. Speaking of family, WP offers a much, much more interconnected experience. Without hopping around apps, I can see history for a given person or group of people, for such things as phone calls, messages, online updates, and photos. I also like that I can link contact records from my various sources, both simplifying my list and making me less reliant on one good master list. One of the main functions of my phone is email. I have many email accounts to keep track of, and even though both OSes do a good job, WP has a couple features I particularly like. I can define a combined view of email accounts, giving me a merged view of email, yet still storing and managing them separately. I also like that WP provides an expand/contract function for conversations, as opposed to moving to new screen as iOS does. WP includes my responses in that thread, which is very handy. 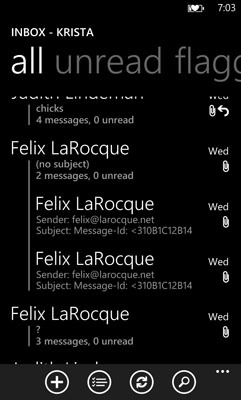 WP also thinks more mobile when displaying the count of messages, showing me how many new messages - since I last looked. That's nice, meaning I can just scan down the list and read the pertinent ones, without feeling like I have to mark them as read to clear my counter. It also means the unread are still unread when I return to my computer to work. Of course work means scheduling and putting those tasks in order.� The calendars in both OSes are very similar, and I love being able to sync multiple accounts and multiple Exchange calendars. However, iOS has a vastly superior month view. The concept of trying to show any data in the day boxes like WP does is pretty much useless, but picking a day in iOS and scrolling up and down the list in the little window at the bottom is remarkably useful. On the other hand, tasks on WP work better, if only because I can create a task on the phone with a due date without setting a reminder. Perhaps that'll be fixed in iOS, and then the two systems will on par with each other. While working, gotta have some tunes to keep the creative juices flowing! 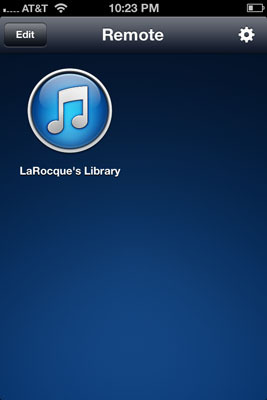 iTunes wins this for me hands-down. I live by smart playlists, woefully lame in Zune. Now, WP8 does now sync to iTunes, wisely, which may ameliorate the problem. Once on the phone, music/songs/genres/playlists are much easier to navigate around in iOS than in WP. Speaking of moving around, my impression is that WP is a much "swipier" OS than the more "press-button" interactions that dominate iOS. 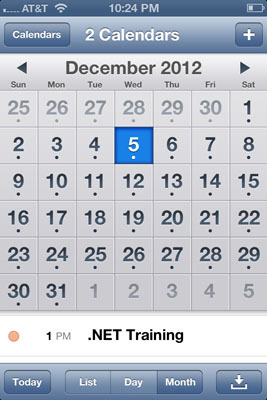 I tried many times to swipe to the next calendar month in iOS, that easily happens in WP. I also love the functionality Remote gives me in walking around the house yet controlling my iTunes-playing music. OK, so switching topics. Actually, switching tasks! Both OSes support� mutli-tasking, after a fashion, not really letting the apps run, but getting me back to them quickly and right where I left off. While iOS wins for how many apps can be listed (and then I'm scrolling around so long looking for that icon I could have just restarted it from the home screen), WP wins in multitasking because I can see two apps at once. This is very useful when I'm trying to use information in one app to use in another. Of course copy/paste could be used for text, but that doesn't work if I don't want the text, or the source is non-textual. For instance, I had to enter a code to join a conference call. I can't paste that into an active call, but I can easily flip back and forth in WP between the phone and the event to lookup the numbers and enter them. Two notes about hardware: I love the back button! It's always there for me, and it goes back. 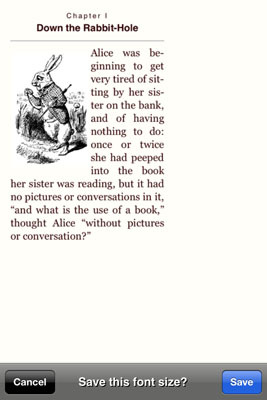 I get frustrated in iOS trying to fnd the back� button , or cancel, or close, or done,� to bring me back to where I was. 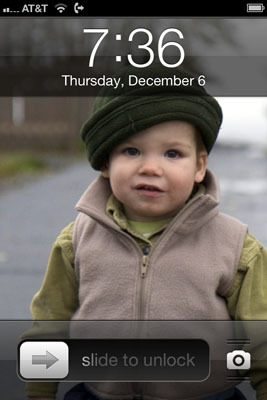 On the other hand, the ability to dock the iPhone is very handy! I also use a PayPal headphone jack cardreader. 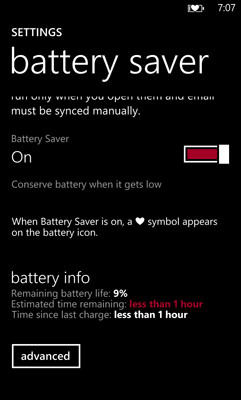 Speaking of hardware, WP's battery saver adds hours of useful phone time even when the juice is almost gone. 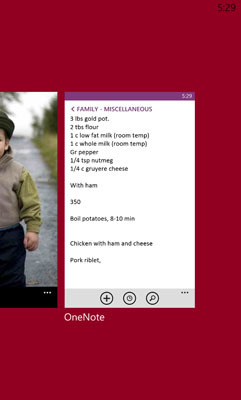 For WP, I live in OneNote, and having multiple notebooks available and pinnable is indispensable to me. The Kids Zone is also a much safer way to hand off my phone to bored kids, without worrying what they'll mess up or poke their noses into. 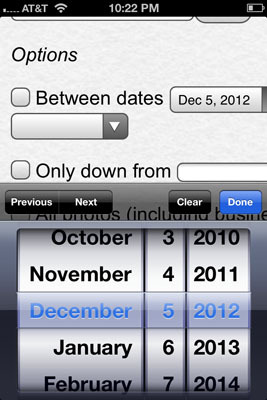 In iOS, I love that Safari gets HTML5 form fields, giving me intelligent data selection options to fill out date, number, and other input types way WAY easier!� Other brilliant ideas include Adobe Ideas, with smooth zoomable sketching, and Stanza, with pinch-to-resize text. To list things I really don't like is actually pretty hard to do for either system. However, there is one for each: in WP, I can see hardly anything when typing an email, message, or OneNote - what, like 4 lines? That's it? That doesn't seem right on that big screen. In iOS, it's very annoying to not have a back button. I want to just go back to where I was, and instead have to go home and restart or double-tap home to bring up the list of apps to go back. Both OSes have matured, work well, and can do pretty much everything I need them to do, more or less.